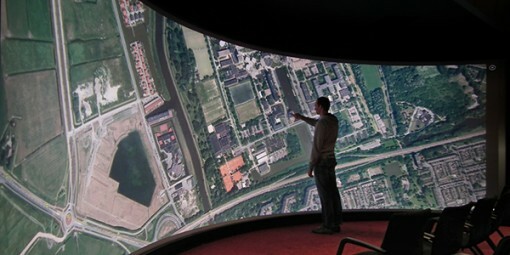 Reality Touchscreen: The World’s Largest? Think again, folks. The Reality Touchscreen developed by engineers at the University of Groningen is the real thing. This screen measures in at 10 meters wide by 2.8 meters high. For those of you who speak/think/count in feet, that’s 32.8 feet wide by 9.2 feet high. Every other touchscreen display is suddenly paling in comparison, isn’t it? So how did the engineers create the screen? In the news report published by the university on their web site, they made use of hardware that can be bought off the shelves and public domain software. All they needed was a splash of creativity – and engineering know-how – and they got themselves a nice big toy. After you watch this touchscreen in action – see the video below – you will most certainly want to play with it, but it is no mere toy. This touchscreen can take more than a hundred simultaneous touches. More so, the screen itself is transparent – something which reminds me of those cool computer screens in sci-fi movies and TV shows. For those who put a lot of weight on design, you will appreciate the curvature of the screen. On the technical side, this baby is powered by 6 HD projectors, 16 IR lights, and 6 cameras. These make the immense multi-touch capacity possible. The display has a 4900 x 1700 resolution and has a 120Hz refresh rate. Now see for yourself what a little do-it-yourself can do. Awe-inspiring is an understatement. I want one of these!